Walter Crane (1845–1915), Britomart (1900), watercolour on paper, dimensions not known, Library of the Arts Décoratifs, Paris. Wikimedia Commons. 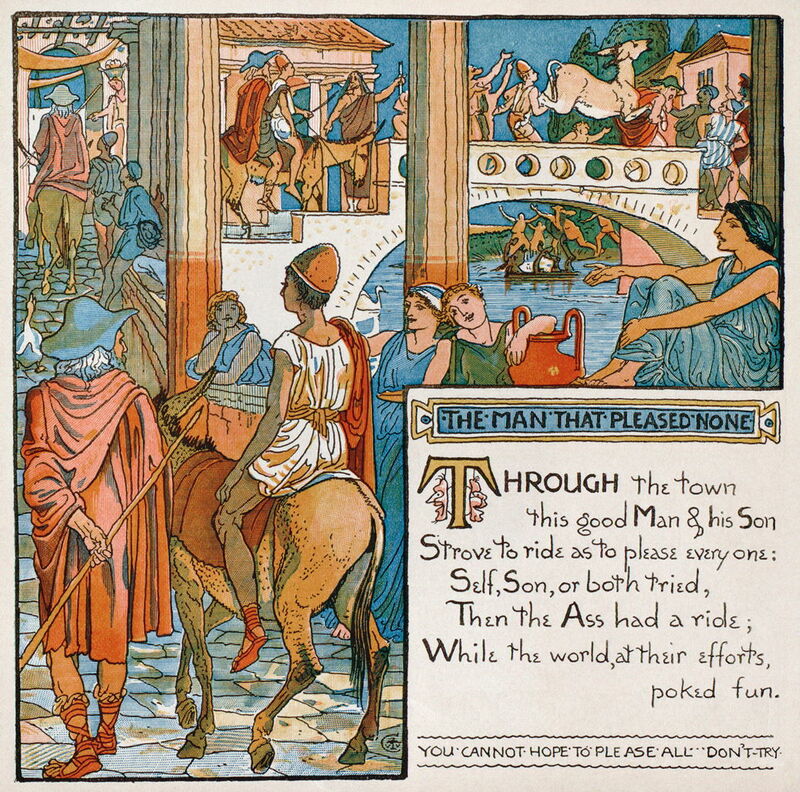 Walter Crane (1845–1915) was one of the most popular, most prolific, and most influential illustrators of children’s books. An enthusiastic fan of the Pre-Raphaelite movement, he was a close friend of William Morris, a key member of the Arts and Crafts movement, and an overt and active Socialist. His career in illustration began in 1863, when Edmund Evans employed him to illustrate ‘toy books’ for children, and he continued to create book illustrations until after 1900. In the later years, he extended his repertoire to include special editions of the Faerie Queene, a volume of Arthurian legends, and a book about the New Forest. However his career in painting had started when his first work had been accepted by the Royal Academy in 1862, and he continued to paint independently of his illustrations, later making several murals. In addition to landscapes, he painted narrative works, but before considering a selection of those I would first like to examine how his illustrations differed. Walter Crane (1845–1915), illustration for Baby’s Own Aesop (1887), engraved by Edmund Evans, George Routledge & Sons. Wikimedia Commons. Crane’s illustration for Baby’s Own Aesop (1887), engraved by Edmund Evans, underlines many of the differences between such illustrations and narrative paintings. First, complying with my rule of thumb, the illustration here supports the text on the page, and does not stand alone from it. Look at the picture and you could hardly deduce the accompanying text, but put the two together and you can see how the picture depicts the narrative in the text. Illustrators also have to be careful to ensure that there are no disparities between their work and the text, although narrative paintings often depart from a literal representation. There are other stylistic clues, such as the use of drawn outlines throughout illustrations, and plain, simple drawings, which are much more likely in illustrations than in standalone paintings, although from the late 1800s onwards these appeared increasingly in paintings. Walter Crane (1845–1915) The Mirror, illustration for Arthur Kelly’s The Rosebud and Other Tales (1909), pen, black ink and watercolor, 20.3 × 15.3 cm, Private collection. Wikimedia Commons. 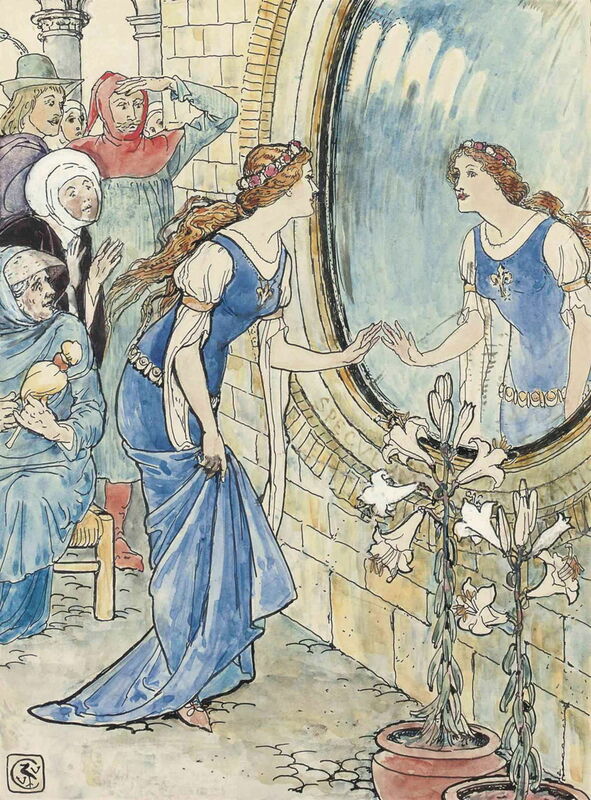 Original artwork for illustration can become more difficult to classify, as shown in this watercolour and ink drawing for The Mirror, one of Crane’s illustrations for Arthur Kelly’s The Rosebud and Other Tales (1909). Here we must fall back on the artist’s intent, which was clearly illustration, and he did not attempt to exhibit this, say, with his other drawings as a narrative series of paintings. This is quite a different process from that seen in Hogarth’s narrative paintings, for example. Crane was one of the first artists to base a painting on Alfred Lord Tennyson’s (1809–1892) poem The Lady of Shalott, published in 1833 and 1842. This tells part of the Arthurian legends, that of Elaine of Astolat, as given in an Italian novella from the 1200s, from which it gets its title. 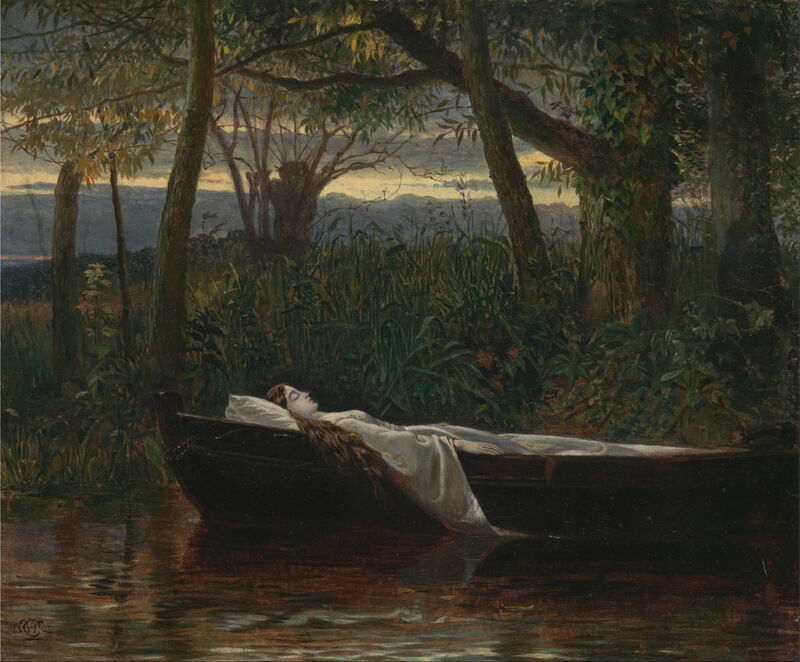 Walter Crane (1845–1915), The Lady of Shalott (1862), oil on canvas, 24.1 × 29.2 cm, Yale Center for British Art, New Haven, CT. Wikimedia Commons. Crane shows the Lady white in death, laid out in her boat, tresses and flowing sleeve draped over its gunwhales into the still water at the river’s edge. This is set in an ancient wood, in dramatic twilight, presumably dusk. This painting was accepted for exhibition at the Royal Academy, and must have influenced JW Waterhouse’s much better-known version of just over 25 years later. 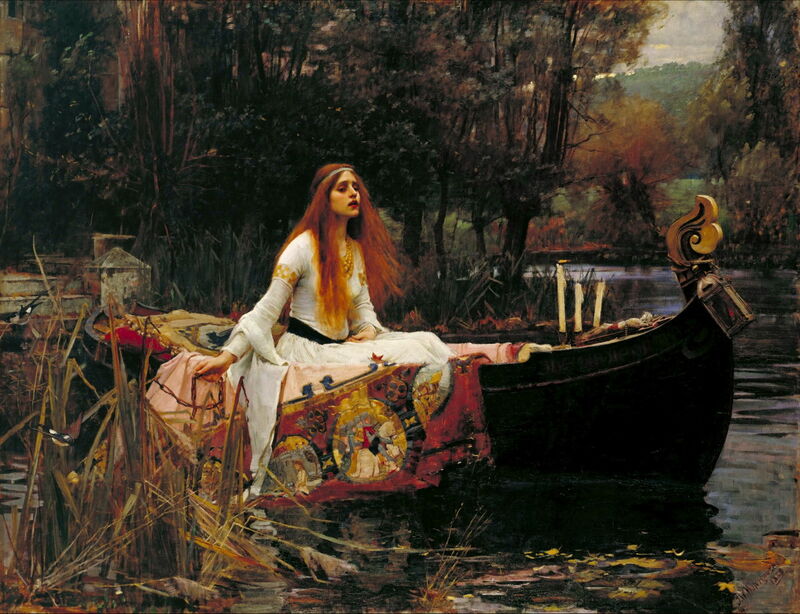 John William Waterhouse (1849–1917), The Lady of Shalott (1888), oil on canvas, 153 x 200 cm, Tate Britain, London. Wikimedia Commons. According to various sources in the Bible, Boaz was a wealthy landowner in Bethlehem, in Old Testament times. He noticed Ruth, a widow, who was in such difficult financial circumstances that she came to glean grain from his fields. Boaz invited her to eat with him and his workers, and started to deliberately leave grain for her to glean. Because they were distantly related, Ruth then asked Boaz to exercise right of kinship and marry her. They had children, and David was their great-grandson. Walter Crane (1845–1915), Ruth and Boaz (1863), oil on canvas, 25.5 × 33.5 cm, Private collection. Wikimedia Commons. 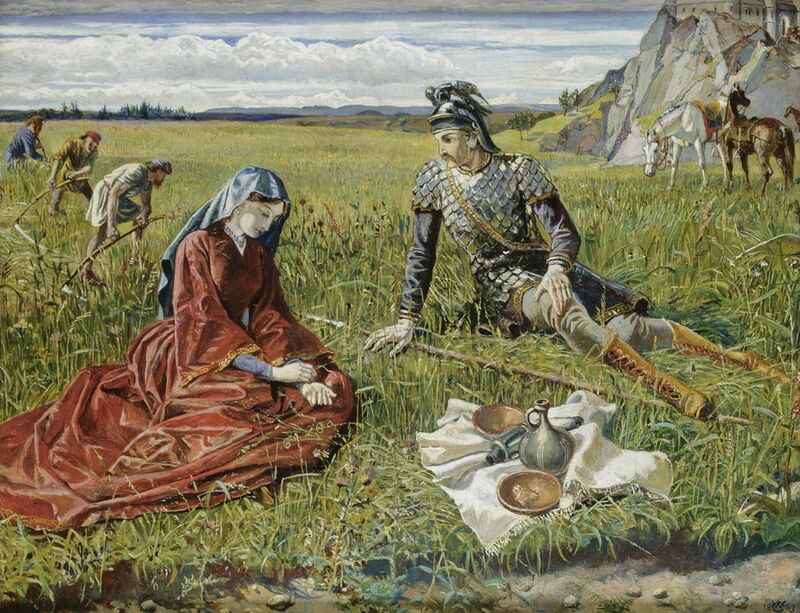 Crane’s painting, which is in oils despite resembling a watercolour illustration, shows the couple at the end of lunch, during Ruth’s gleaning. Their dress is an odd composite of the Biblical and Arthurian. She is looking down at her hands, as if contemplating grain held in her left palm. He has turned and looks towards her. In the background Boaz’s workers continue the harvest, and saddled horses are idle, a castellated house set in the crag behind them. 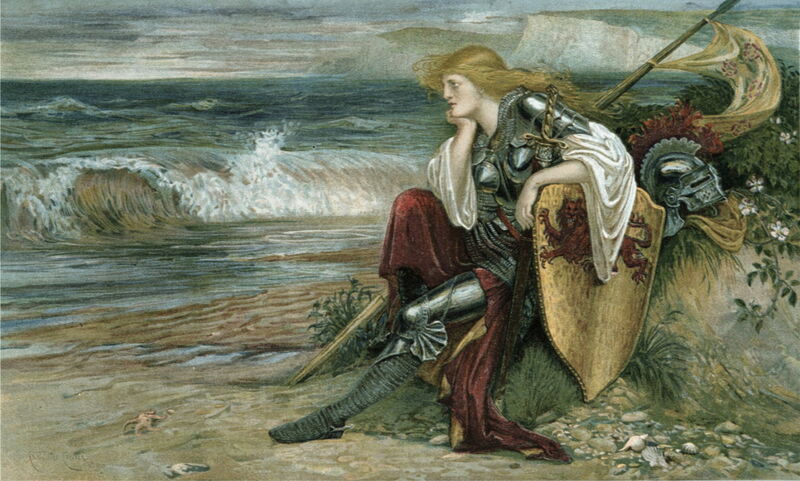 Walter Crane (1845–1915), La Belle Dame Sans Merci (1865), oil on canvas, 48 × 58 cm, Private collection. Wikimedia Commons. Again, Crane is one of the earlier artists to represent this in a painting, with subsequent similar depictions by Arthur Hughes and Frank Dicksee. 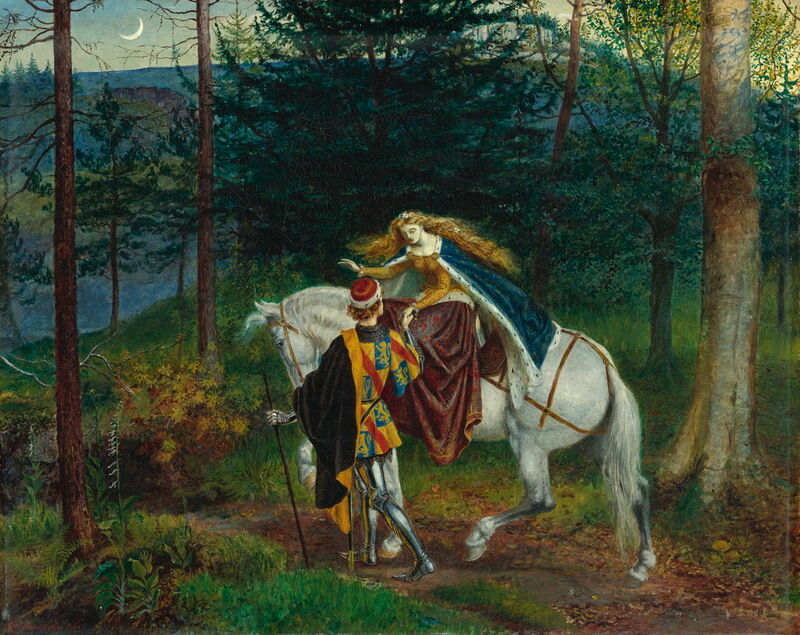 The ‘belle dame’ of the title is shown riding side-saddle on the knight’s horse, flowers in her long, flowing tresses, and the knight (clad in armour and heraldic overgarments) holds her hand. Sandro Botticelli (Alessandro di Mariano di Vanni Filipepi), The Birth of Venus (c 1486), tempera on canvas, 172.5 x 278.9 cm, Galleria degli Uffizi, Florence. WikiArt. Botticelli’s The Birth of Venus (c 1486) is one of the world’s most famous paintings, and shows the goddess Venus, when she was born from the waters as an adult, arriving at the shore. 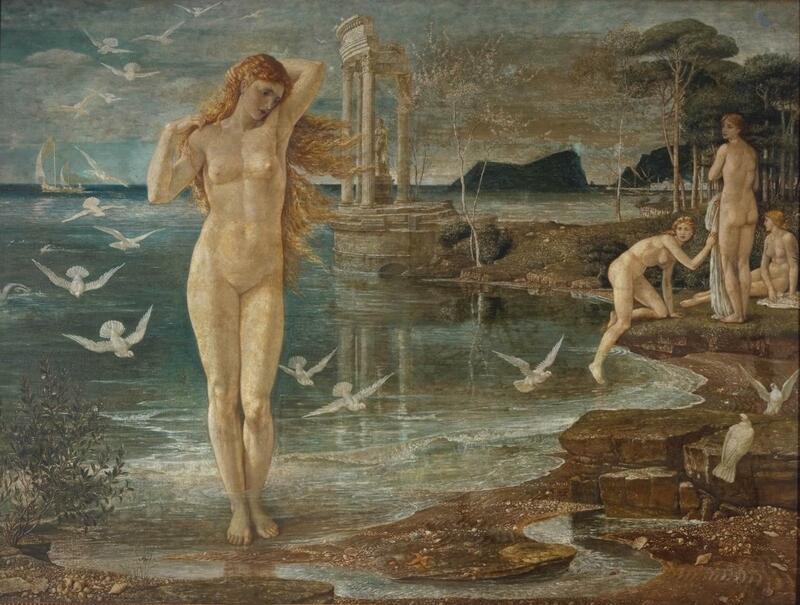 Walter Crane (1845–1915), The Renaissance of Venus (1877), oil and tempera on canvas, 138.4 × 184.1 cm, The Tate Gallery, London (Presented by Mrs Watts by the wish of the late George Frederic Watts 1913). Photographic Rights © Tate 2016, CC-BY-NC-ND 3.0 (Unported), http://www.tate.org.uk/art/artworks/crane-the-renaissance-of-venus-n02920. 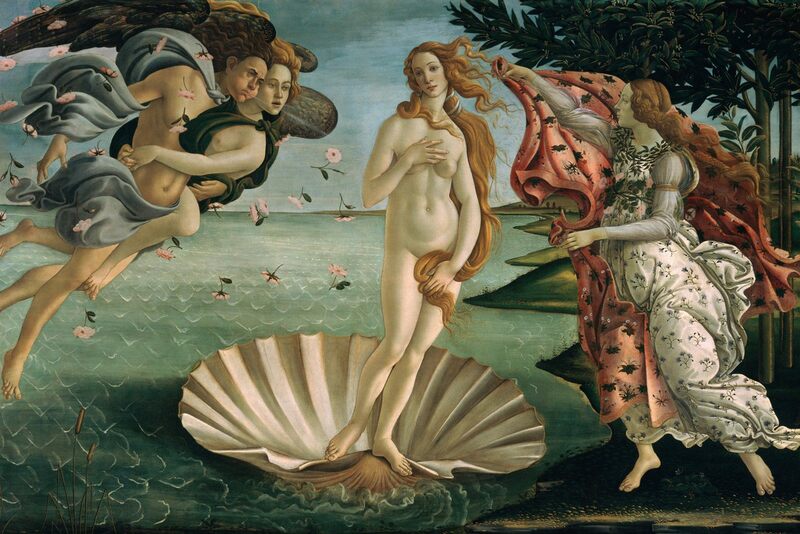 Crane bases his Venus on Botticelli’s representation, and links her rebirth back to the Renaissance. She is stood at the edge of a placid sea, the water just above her ankles. Three attendant graces are also getting out of the water in the middle distance, but appear to have been bathing. A train of white doves flies down and behind Venus, to start landing on the shore at the right. In the distance are the remains of a classical building at the water’s edge, and what appears to be a section of Mediterranean coastline. Further out at sea, a sailing boat passes by. Crane painted this in tempera, as Botticelli did his original. In classical Greek mythology, Persephone, daughter of Zeus and Demeter, is the queen of the underworld. She acquired that role when Hades, god of the underworld, was overcome with love and lust from one of Cupid’s arrows, and had seen Persephone picking flowers with friends. Hades then abducted her to be his queen. Walter Crane (1845–1915), The Fate of Persephone (1878), oil and tempera on canvas, 122.5 × 267 cm, Private collection. Wikimedia Commons. Crane shows Persephone at the moment of her abduction. She had been picking spring flowers in the meadow with the three other women shown at the left. Hades brought his chariot, complete with its pair of black horses symbolising the underworld, and is seen gripping Persephone’s right arm, ready to move her into the chariot and make off. It is remarkable how, although their body language is emphatic and clear, each of the five figures has a completely neutral facial expression. This helps make it appear like a frieze, an effect probably enhanced by Crane’s use of oil and tempera. The horses appear in complete contrast, champing at their bits and poised to set off at a gallop: another feature which is common in friezes. Remould it nearer to the heart’s desire! Walter Crane (1845–1915), The Roll of Fate (1882), oil on canvas, 71.1 x 66 cm, Private collection. Wikimedia Commons. 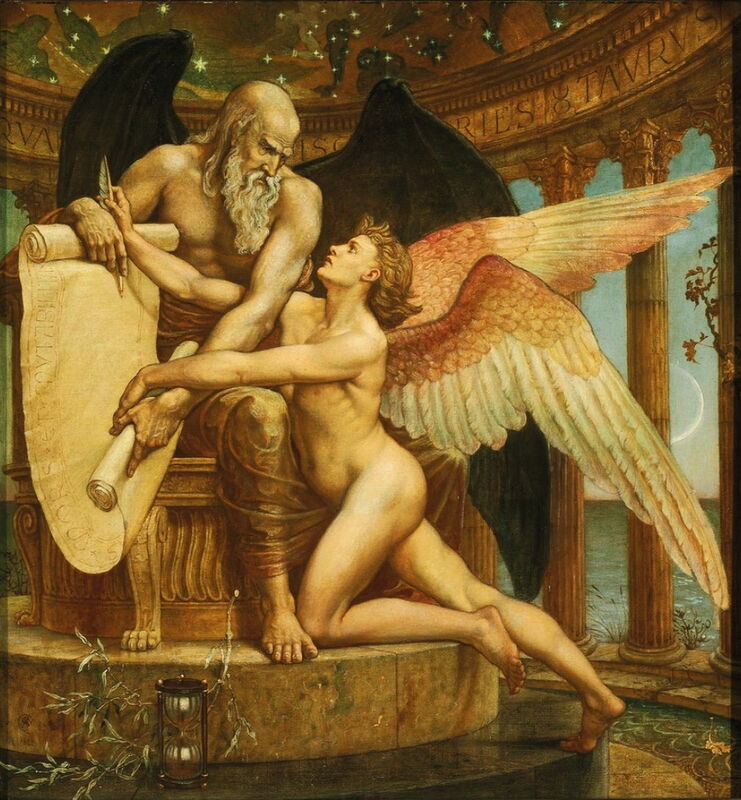 Here a male winged angel is shown on bended knee before the figure of Time. The latter holds his scroll, on which the destiny of all mankind is recorded. The angel’s hands are intertwined with those of Time: each right hand grasps the quill which is used to record destiny, each left hand the other end of the scroll. The angel looks up, pleading, at Time, but Time looks down at him with a frowning scowl. In front of the dais on which the angel kneels and Time sits is an hour glass. The whole is set inside a circular building which shows the stars through its roof, like a planetarium. I think that this is one of Crane’s most successful narrative paintings, with its excellent use of facial expression and ingenious body language. This gives it an emotional depth which contrasts with his previous narratives which have either been static or devoid of emotional expression. Endymion was a classical Greek mythological character, an Aeolian shepherd. Although accounts differ, there are threads which run that Selene, the Titan goddess of the moon (in Roman terminology, Diana), fell in love with Endymion, when she found him asleep one day. Selene/Diana asked Zeus to grant him eternal youth, which resulted in him remaining in eternal sleep. In spite of his somnolence, Selene/Diana still managed to have fifty daughters by him. Walter Crane (1845–1915), Diana and Endymion (1883), watercolor and gouache, 55.2 × 78.1 cm, Private collection. Wikimedia Commons. 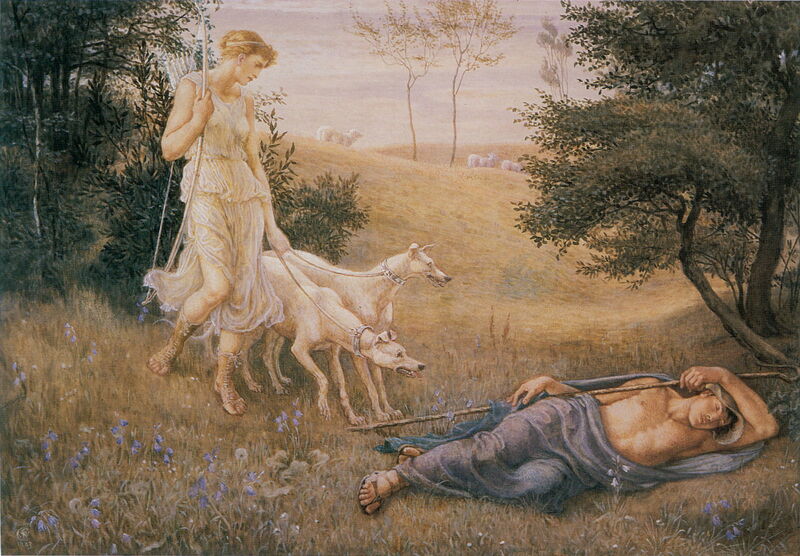 In this beautiful pastoral watercolour, Endymion is seen, fast asleep, in a meadow. Diana is in her other role, as hunter, with her dogs, bow and arrows. Endymion’s flock of sheep is in the distance. Crane’s narrative has reverted to its earlier, more static form. 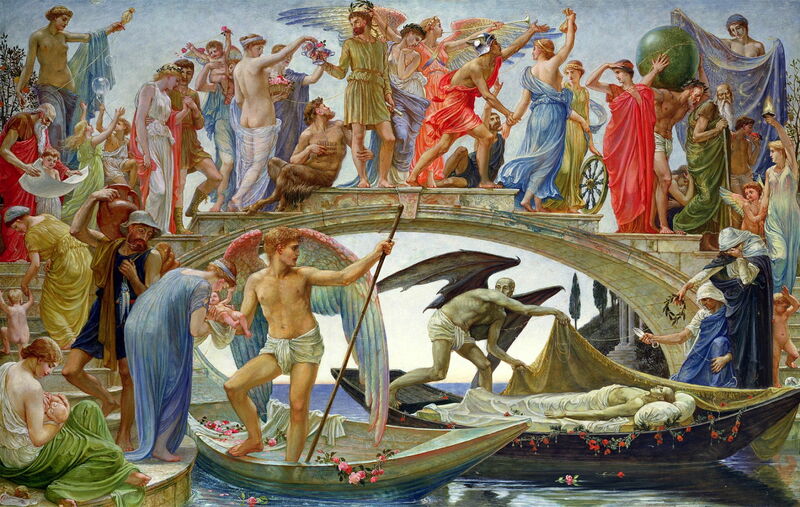 Walter Crane (1845–1915), The Bridge of Life (1884), oil on canvas, dimensions not known, Private collection. Wikimedia Commons. Crane’s allegorical narrative of life as a bridge appears unique to him. It shows a newborn baby arriving in the hand of a winged angel in a white punt/gondola, left of centre. The baby is handed over to a mother or nurse, fed at the breast at the bottom left corner, walking up the steps, and learning at the top. Children play, then grow into young adults, and marry as they reach the top of the bridge. Throughout this runs the thread of life. The mature adult in the middle of the bridge (by its keystone) then ages steadily, bearing the whole globe during the descent. He then gains a long white beard and walking stick during the descent into old age, finally dying, his body being placed in the black punt/gondola, where it is attended by the angel of death. Grieving relatives stand on the shore and make their farewells, one cutting the thread securing the boat to the shore with a pair of traditional scissors. Britomart has her origins in Britomartis, the Minoan goddess of mountains and hunting, who passed into Greek mythology as a mountain nymph. She was adopted by Edmund Spenser in his epic The Faerie Queene as an allegory of virtue, based largely on military might. She is also held to represent Queen Elizabeth I. As one of the few female knights in myth and literature, she has more recently been adopted as an emblem of female power. In Spenser’s account, Britomart is young and beautiful, and falls in love with Artegal when she first sees his face in her father’s enchanted mirror. She sets off on a quest to find him, carrying an enchanted lance which defeats all, until she loses to Artegal himself. Her quest takes her around the world, on a pilgrimage to the shrine of Isis, and to visit Merlin the magician. Eventually she finds Artegal who has been captured by the evil Radigund, and frees him and several other captured knights. Britomart is shown on a very English beach – the chalk cliffs of the south coast behind her – staring wistfully into the distance, her chin propped on the heel of her right hand. She wears full armour, mixed with more feminine clothing. Her left arm rests on her shield, the enchanted lance beside her, and her helmet on a dune behind her. As with many of the Pre-Raphaelites and others who came under their influence, most of Crane’s narrative paintings are static, and many are surprisingly emotionally cold. His two more allegorical works – The Roll of Fate and The Bridge of Life – were probably his most strongly narrative, with only the former making full use of facial expressions to impart emotion. This is puzzling, given his extensive experience illustrating events within narratives, and confirms his aim of art for art’s sake, and his primarily decorative leaning. O’Neill M (2010) Walter Crane. The Arts and Crafts, Painting, and Politics, 1875-1890, Yale UP. ISBN 978 0 300 16768 9. Posted in General, Painting and tagged allegory, Botticelli, Crane, illustration, narrative, painting, Waterhouse. Bookmark the permalink. Reblogged this on Welcome to the world of Maura 'n' meg.